The Italian School offers separate levels of classes for children and youth based on age, maturity level and knowledge of Italian. Our objective is to inspire a strong passion for our language, culture and traditions. Classes are held at Il Centro on Saturday morning or afternoon and on weekdays at our Outreach locations throughout the Lower Mainland. Two specialized programs for children aged 18 to 36 months: Italian for Toddlers class on Tuesday morning or Filastrocche on Saturday. 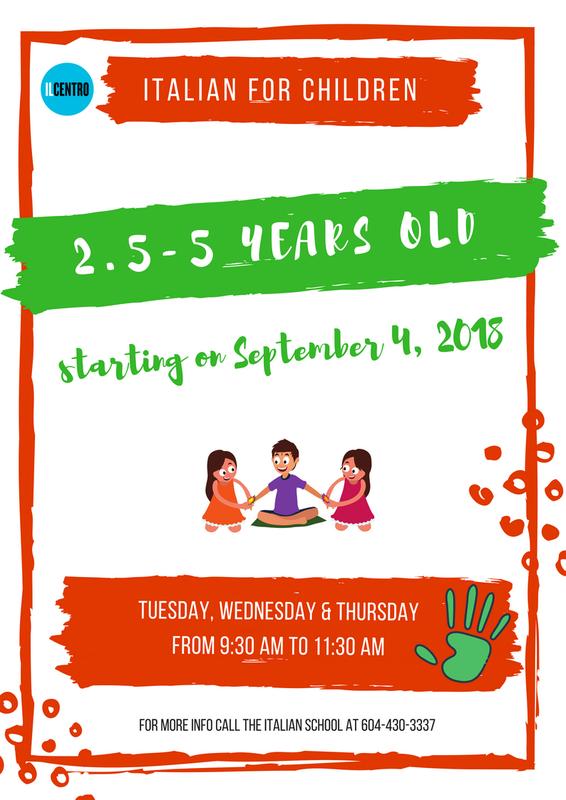 We also offer a 2.5 to 5 years old program, which is held on Tuesday, Wednesday and Thursday morning. 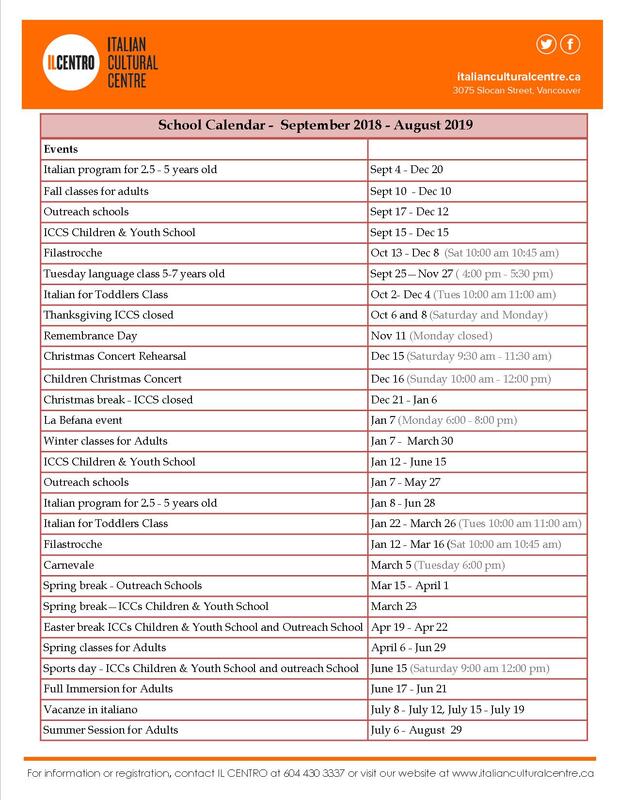 To stay updated with our events, please check our Calendar. Tuesday morning from 10:00 am to 11:00 am. Held in the Kids’ Corner in the Library, this class has been created upon request as a replica of our successful Saturday morning “Filastrocche” drop-in class. The little ones accompanied by their parents or grandparents get together for one hour to revive Italian traditional children songs and stories, while having lots of fun. Note: Parental/guardian presence is required for the whole class. Monday to Friday from 9:00 am to 3:00 pm. “Vacanze in Italiano” is back this summer at Il Centro, for two exciting weeks in July! The program includes cooking, art, craft, music, sport, outdoor activities, games, and, of course, tons of fun. The main focus of our students is the continuous development of the Italian language and culture, through our full immersion program. Children are given the opportunity to advance their vocabulary through various games, songs, and fun outdoor activities. The treats prepared by the children belong to the traditional Italian cuisine: biscotti, pasta, bread, crostatine and pizza, which they enjoy for lunch on Friday. ***Refund Policy: Membership Fees are non-refundable. No refunds after the first class. An administration fee of $10.00 will apply to all credits, $25.00 to all refunds. No refunds prior 2 working days before the starting of the course. Join this unique Summer Camp realized in collaboration with the Cinematheque open to youth from 12 to 16. This is a youth lead project, which will offer youth the opportunity of exploring their connection with the Italian language & culture through film-making. The participants will produce high-quality videos, with extensive professional support and mentorship provided by filmmaker educators. While the Cinematheque’s facilitators will provide technical assistance, the creative process will be driven by the youth. The youth will define the style and the tone of each video. The final videos will not necessary be a polished and glossy product, but an authentic and inspirational work created by young filmmakers. The final videos could be officially screened at ICC, immediately after the camp or during another public event, to show the participants that the ICC values their works and opinions. Monday afternoon from 3:00 pm to 5:00 pm. Purchase or renewal of the ICC Annual Membership is also available on line. You will be prompted to purchase a membership in Checkout. ***Refund policy: No refunds will be given after the first two sessions. Credit shall be granted after this period to be used within one year. An administration fee of $10.00 will be applied to all credits, $25 fee to all refund. Membership fee is not refundable. Saturday morning from 9:30 am to 11:30 pm or 1:00 pm to 3:00 pm. This program provides a fun and nurturing environment, along with academic preparation. Our program is a blend of play, free exploring and teacher-led activities for learning Italian language in the most funny and natural way. Saturday morning from 9:30 am to 11:30 pm. Please be advised that for better managing the kids and providing a customized program, this class is actually split in two. One for kids 3 to 4 years old, another for kids 4 to 5 years old. Annual membership can be purchased for $25.00.